We are a proud food service and catering company serving our community for over 30 years. We are committed to providing our customers with outstanding service and impeccable quality in all food service. 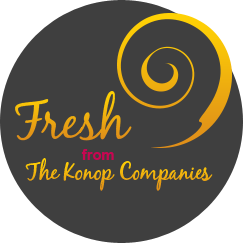 Along with preparing an average of nearly 2,500 daily meals, Konop Food & Catering has its own in-house bakery, preparing fresh, taste-tempting desserts. We provide services for school & daycare lunches, business & industry accounts, senior lunch programs, and catering events tailored to your individual needs. Our enthusiastic staff will do everything possible to merit the confidence placed in us. Call us today for your food service and catering needs.